Hello! Thanks for stopping by my webpage. I am an OIF Veteran and I enjoy hand-crafting chainmaille jewelry. If you’d like to see pics of some of my recent work, please check out my gallery. If you like what you see, please let me know by clicking on the comment link here — I’d be very happy to work with you to make a custom piece that is uniquely yours. Don’t forget to include a way to contact you (preferably email). I do not keep a list of any sort…email addresses are *only* used to contact you about your custom item. Once you receive your item and are happy with it, I will not email you again. I hate spam and do not do that to folks. 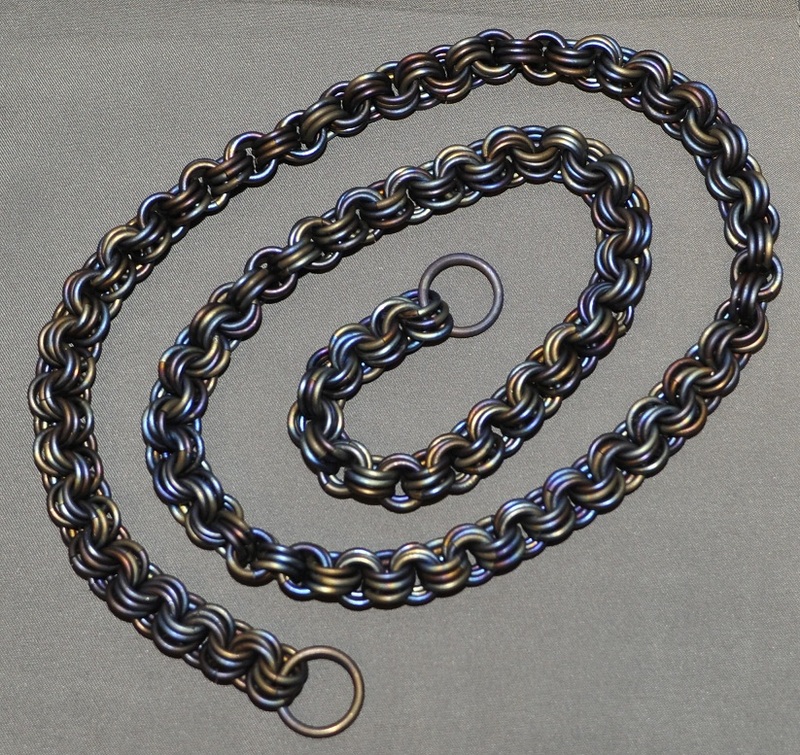 An example of a flame-colored 3-in-3 Titanium wallet chain. If you’d like to read more about me and my chainmaille work, please check out this page. Thanks again for looking. Please feel free to contact me if you have any questions. Love your chainmaille! Outstanding work. I really like seeing creative and different things like this. I do a lot of woodwork myself (knife boxes and boxes in general) and am just getting into leather working. I work as a web developer, creating digital things, so it feels good to make something real and tangible with my hands. I would be interested in one of your titanium bracelets, the photo that I downloaded from your website is titeled “16ga Titanium 4-in-1 Persian (38″)” for $125. I’m a bit confused by 38″ in the title, it does’t look like it in the photo, I think I would need a 10″ bracelet. Please let me know how to go about deciding on what I’d want and placing an order. What size are the links on the byzantine chain? They can be different sizes. I do not provide tutorials for anyone. If you want to actually buy a bracelet, please let me know and I will work with you to ensure that I make your bracelet exactly to your own specifications. But I will never give out specific ring sizes like that…folks can tell me what overall bracelet thickness they would like and I will make a bracelet in their pattern of choice. Hi! My name is gene and I like to buy nasty, bad-quality, cheap-o chainmaille from your “competitors” and then brag about it to everyone on edc exchange on facebook. I really do not know good quality when I see it, so that is why I bought crappy junk when I went looking for chainmaille. I mean, aluminum is a whole lot cheaper than titanium and since I really don’t know the difference in quality of both the materials and the workmanship, I just go for the absolute cheapest, worst quality I can find because I am a cheap-skate. I wish I could buy from you, but I know you blocked me both on facebook and ebay. I am sad I will not ever be able to buy chainmaille from you because I know now that it is the best quality available anywhere. I was an idiot to buy that bad quality aluminum stuff from ripcordz. I also do not tolerate idiocy. That is why I will never, ever sell a single RING of chainmaille to you, let alone a complete item. If someone cannot tell the difference in quality between the time and workmanship I put into making MY maille and that bullcrap that “ripcordz” passes off as maille, then I don’t want you as a customer anyway. No loss to me. I want to sell to folks that truly appreciate fine craftsmanship and understand that excellence comes at a price. It is for that reason that I NEVER use aluminum. If you want some crap-maille made out of recycled soda cans, by all means go buy from that “ripcordz” moron. If you want the best chainmaille available anywhere in the world, then I will provide that. Not interested in selling to people like you. Good riddance.